Space shuttle Atlantis nears touchdown on Runway 33 at the Shuttle Landing Facility at NASA's Kennedy Space Center in Florida. Landing was at 8:48 a.m. EDT, completing the 12-day STS-132 mission to the International Space Station. 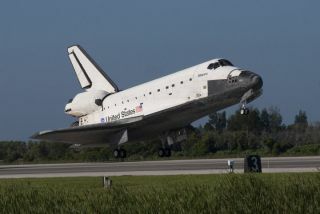 It was the 32nd and final planned flight of Atlantis. With a new Congress now in charge, NASA is stuck in a political limbo, waiting for the funding needed to carry out a new objective approved by the last Congress. Lawmakers in October passed – and President Obama signed – a NASA authorization bill that gave America's space agency the go-ahead to abandon its previous moon-oriented human spaceflight program and take aim at new targets: visiting an asteroid and Mars. That bill called for NASA to receive $19 billion in 2011 – a boost from the 2010 NASA budget of $18.3 billion. But that promised funding was not appropriated, since the outgoing lawmakers, along with the president, could not agree on a federal budget. Instead they enacted a continuing resolution – a kind of placeholder law until a full budget can be agreed upon – that froze the federal government, including NASA, at 2010 spending levels through March 4. "Clearly the big issue with NASA in this Congress is money," said Henry Hertzfeld, a professor of space policy and international affairs at George Washington University in Washington, D.C. "The details of the budget really hadn't been fully resolved with the old Congress, which left us with a continuing resolution and nothing more. The question is what happens when they begin to start debating NASA." Based on claims by new House Speaker John Boehner (R–Ohio), who said his party will aim to cut non-military discretionary spending back to 2008 levels, the space agency could be in for some serious budget cutbacks. "There's going to be a lot of hard negotiations," said space policy expert Roger Handberg, a political scientist at the University of Central Florida. "NASA's problem is it's not a priority. When they start slicing and dicing, NASA may be the one that gets to ‘contribute to the cause.’ I think it could be a disaster for the government part of the program." Money isn't the only issue for NASA. The NASA authorization bill instructed the space agency to cancel most elements of its moon-bound Constellation program, which had been initiated under President George W. Bush. Yet the government's 2010 appropriations bill prohibited NASA from terminating or altering the current Constellation program without the consent of Congress in a future appropriations bill. That means that, through early March, the space agency would have to spend an additional $500 million on the Constellation program before shutting it down altogether, according to Florida's Orlando Sentinel newspaper. So NASA is stuck halfway between an old space-exploration vision and a new one, without definitive instructions from lawmakers on which direction to follow. "The authorization bill gives them the blueprint they want to follow. But the problem is, the appropriations bill is where the rubber hits the road," Handberg told SPACE.com. "That’s where the restrictions are." It will take a new 2011 budget appropriations bill to really resolve the issue. "Everyone thought they were going to finally do a budget before the new Congress," Handberg said. "By not doing the new budget, they left all those impediments to killing off Constellation in place." Some opponents say the private space industry is not yet ready to take on the task of launching astronauts to the space station – after all, no commercial spacecraft has yet carried people to orbit. The most hopeful step yet was the success in December of private-sector company SpaceX of Hawthorne, Calif., in launching its unmanned Dragon capsule into orbit atop its Falcon 9 rocket and recovering it after an ocean splashdown. Detractors of the new NASA plan oppose the loss of many Constellation-related jobs it would entail, though the Obama administration maintains that many new jobs would be created. Still, NASA’s current quagmire may last for a while as other, more-pressing matters are debated by the new Congress, which convened Jan. 5. Handberg said: "NASA's just not important enough in the bigger picture, in the context of Congress. I don’t think anybody hates NASA, they just don't care. That makes life very hard." Hertzberg noted: "NASA is not a huge amount of money ? it's less than 1 percent of the budget ? so it's not going to be the first thing discussed. I think we can expect some delays before they really get serious about the NASA budget." And the longer NASA has to wait, the harder it will be to achieve any of its new objectives on time. "The amount of money it would take to build a new heavy-lift vehicle for example, will take time," Hertzfeld said. "The more delay, and the less money, the longer it will take." Some supporters of NASA hope that it can escape the budget ax that falls on other agencies. "Even though there's an appalling amount of pork-barreling in most local congressmen's support of NASA, there's also a wider consensus that space spending is a long-range wealth creator by being a knowledge and know-how creator," space policy expert James Oberg, a former shuttle mission control engineer, said after November's elections. "So financial support of NASA and similar research activities may be considered fundamentally different from day-to-day costs of governing, and might be successfully promoted as part of the solution, not part of the problem."